Pharmacy flu vaccine: Health insurance policies should cover drug store shots. 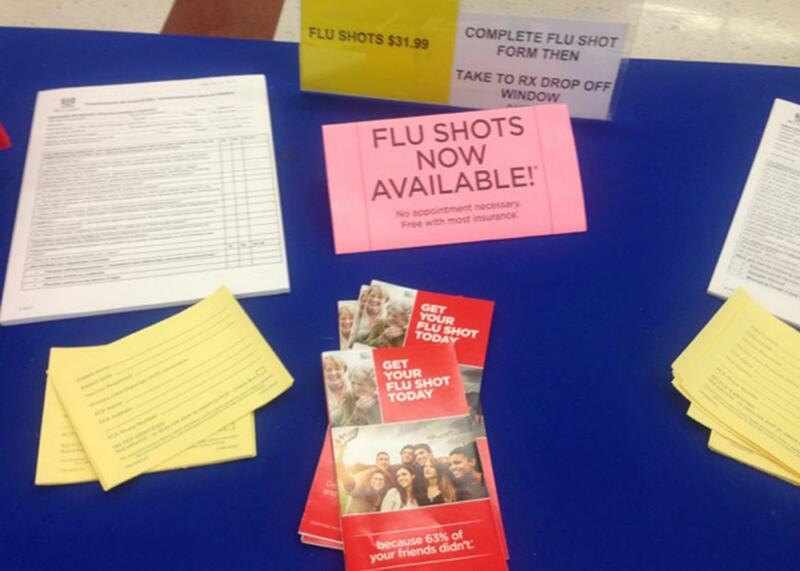 Advertisements for the flu shot at the author’s Rite Aid. I had asked for a state-of-the-art version of the vaccine—one that protects against four strains of the virus rather than three—and was pleased to learn my Rite Aid had it in stock. The vaccine costs about $40, and I could have afforded it, but I was flabbergasted—and even suspicious that the pharmacist had made a mistake. I asked about the old-fashioned three-strain, or trivalent, vaccine. Excluded too. I had entered the Insurance Illogic Zone, another dimension as vast as space and as timeless as infinity. In a push to increase adult vaccination rates, the U.S. National Vaccine Advisory Committee in 2011 explicitly recommended increasing the use of pharmacists as vaccine providers. Many adults, the committee recognized, “do not have a single medical home,” meaning a clinic or doctor’s office where they routinely go for care. Pharmacies are an ideal place to offer adults vaccines. Few businesses are more convenient: Rite Aid, Walgreens, and CVS have a total of more than 20,000 locations—that’s about the same as all the McDonald’s and Starbucks in the country put together—they’re open long hours, and they sell many goodies to lure customers who aren’t simply concerned about their health. Big-box stores like Walmart, Target, and Costco have pharmacies, too. It’s something of a duh, but cost-effectiveness studies have shown that it’s also far cheaper to administer vaccines through pharmacies than medical offices.